One of the books that I used was the cssbb primer from the quality council of Indiana, the actual title of the book is Certified Six Sigma Black Belt Primer. This book is a must have for your six sigma black belt asq preparation. The other material that was very helpful was the Indiana quality council test bank and I think the actual name was the Certified Six Sigma Black Belt Exam CD. This CD had a good amount of six sigma black belt practice exam questions to prep for the six sigma black belt exam. Based on my experience most of the questions are similar to the actual asq questions. I also got the Certified Six Sigma Black Belt Solution along with the black belt exam CD and cssbb primer from the quality council of Indiana. Keep in mind that asq black belt exam preparation would take some time. You might want to look at the asq black belt exam dates and work backwards to budget time to study. In terms of other asq cssbb books I used the The Certified Six Sigma Black Belt Handbook by T.M. Kubiak and Donald W. Benbow, I believe that I had the the certified six sigma black belt handbook second edition when I was taking the asq lean six sigma black belt exam. I only used this book to do questions at the end of the chapters and to look up something that I didn't understand from cssbb primer. I mostly used the cssbb primer book and I used the asq cssbb handbook as a supplement. I hope this quick guide on how to pass the asq six sigma black belt exam was helpful. At the end of each section within the printed version of CSSBB Primer you should find blue pages with cssbb exam questions. These blue pages are so important for the asq blackbelt exam as well as your cssbb asq certification and they hold the key to you passing the asq six sigma black belt certification exam and achieving the asq black belt certification. The blue sections will provide lean six sigma black belt exam questions and answers that are very similar to the actual asq cssbb questions. Doing the questions in the blue sections must be part of your asq cssbb preparation. 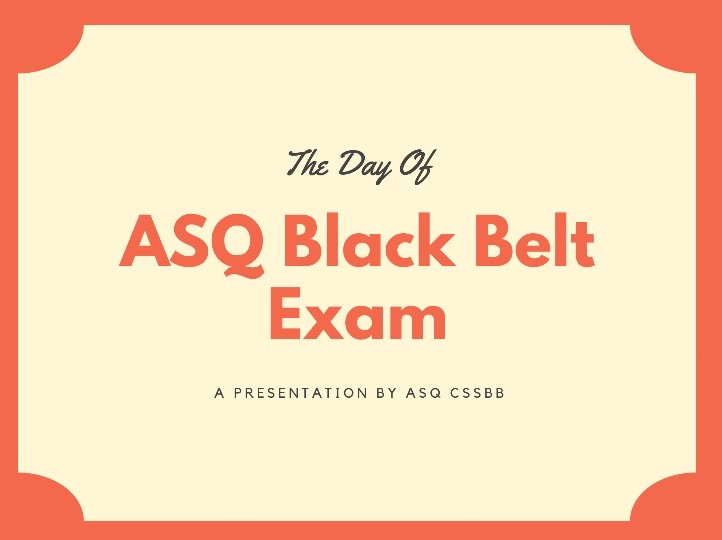 After studying each section you should do all of the asq black belt practice exam within the blue pages. I think you should be aiming to get 90% of the questions correct on each of the sections in order to achieve the asq six sigma black belt exam pass rate. 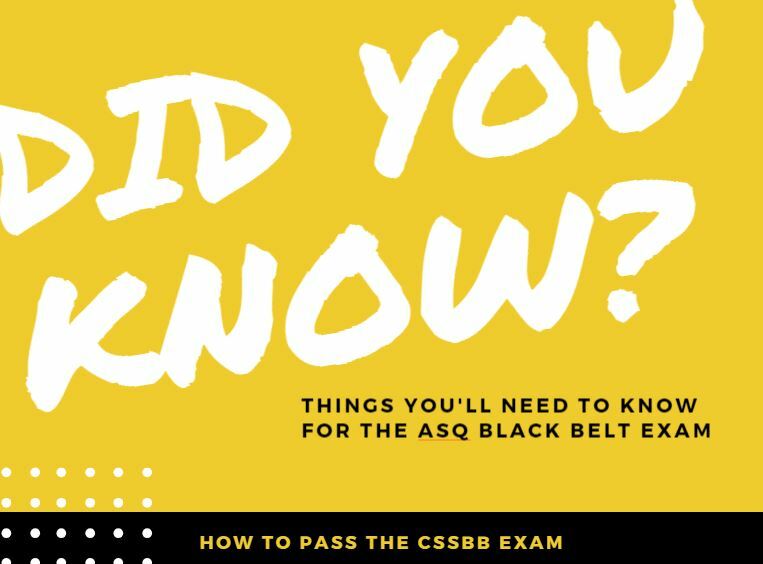 As part of your asq black belt exam preparation if you do all of the cssbb exam questions in the blue section and you’re getting over 90% correct in each of the sections you should be all set to go for the asq black belt exam. As you are studying for the exam as a motivation factor keep in mind that all of the studying will be worth the time and effort since the best six sigma black belt certification is the six sigma certification from asq. Also, as a motivation keep in mind that in terms of cssbb salary American Society for Quality Six Sigma Certification is probably the best black belt certification as far as I know. I would highly recommend that before you even start the cssbb exam preparation that you take a asq cssbb practice exam. These questions are very similar to the asq six sigma black belt exam questions. You can find the free asq cssbb sample exam in the same page as the link to the cssbb bok. (six sigma black belt exam questions pdf) Remember, that this is a six sigma black belt exam questions free download directly from the test makers. Since asq cssbb exam sample is direct from the test makers, I think having completed the asq six sigma black belt exam sample questions would help you familiarize yourself with how asq cssbb exam questions are written. I think the six sigma black belt exam questions and answers pdf only provides the answers, but I don't think the black belt exam questions provides much more detailed explanation as to why one answer wrong and the other was correct. I think taking the actual asq certification black belt practice exam and getting that six sigma black belt test result directly from the test makers is a big help for asq blackbelt exam. Even though it's a short practice exam it should give you a good idea on the areas that you would need to focus on for the six sigma black belt certification exam. I think if you keep taking cssbb practice tests it should prepare you for the actual cssbb exam. For the cssbb asq exam, I do think the Indiana quality council test bank provides more detailed black belt exam questions and answers and their cssbb question bank is much more in depth for each category. I found the materials from asq quality council of Indiana really valuable as part of my asq cssbb exam preparation. I also think asq has their own asq cssbb question bank and I had initially book marked the six sigma black belt question bank from asq but the cssbb primer from the quality council of indiana and the cssbb question bank from them were so comprehensive that I didn't need to use asq cssbb question bank. However, that doesn't mean you won't need it to achieve asq cssbb passing score. If you feel that you need as many cssbb practice tests as possible then by all means get the asq cssbb question bank. You might also want to think about enrolling for this asq cssbb training, since it could be valuable for achieving asq black belt exam passing score. I think having the asq black belt training helps a lot in preparing for the asq certified six sigma black belt exam. You can take the black belt online training at your own pace to achieve the cssbb certification. The books I will list below are a good refresher for statistics for six sigma black belts as part of your asq ssbb certification. I believe that these books should be part of your six sigma black belt study guide. 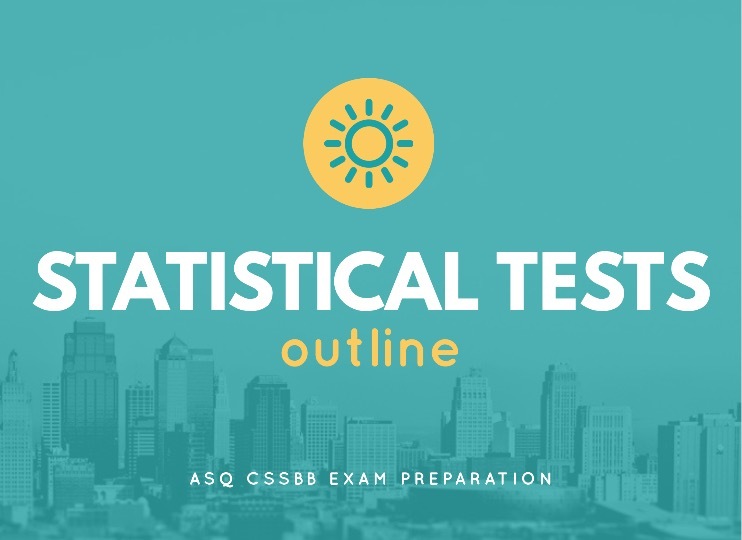 You can also download the outline of a few statistical tests that you need to know for the CSSBB exam. Choose only one from Step 1. These are some of the initial asq certification requirements in order to register for the six sigma black belt exam. The steps I described are just for registering for the exam. There are lot more steps that needs to taken in order to achieve the asq six sigma black belt certification. One of the steps is to spend time studying for the exam. I think this asq six sigma black belt training course can help you study for the black belt exam. 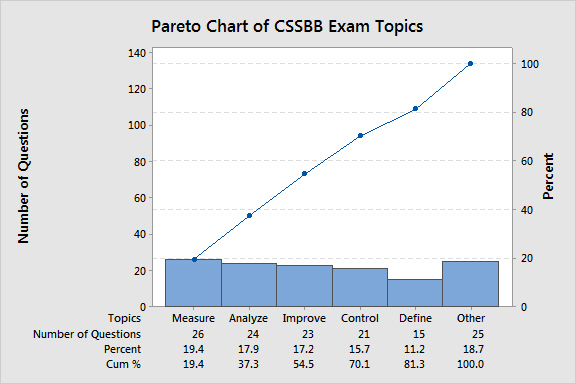 There are 165 questions in the CBT CSSBB exam and they give you 4 and ½ hours for the exam. Only 150 questions are scored and 15 are not scored for the asq six sigma black belt. However, I don’t believe there is a way to tell which asq black belt exam questions are not going to be scored. Since you don’t know which black belt exam questions are not going to be scored I would approach this as a 165 question test and that gives you about a little over minute and a half per question. After taking the black belt exam the results are available right away. When it used to be given by paper and pencil I had to wait until the asq six sigma black belt exam results were posted on the ASQ website. Even though asq cssbb exam results are available right away you don't get the actual printed american society for quality certification until much later. You would most likely be getting the printed asq six sigma certification by mail. You should also keep in mind that you won't actually get a numerical passing score for asq cssbb exam, it will just basically tell you if you passed. My asq cssbb exam tips are to arrive early to the testing center and make sure you are prepared to take the exam. You should have the CSSBB Primer with you, calculator, your ID and any other required documents. With the new CBT CSSBB exam there is a calculator on the computer screen, but I do think it’s a good idea to bring a calculator you are familiar with. Also, make sure to bring some snacks, water and may be some granola bars. If you like Almonds or other things that are filling for you then I would bring them with you. The important thing is to make sure you're not hungry during those 4 and ½ hours and can finish the exam in one sitting. Also, I remember they did allow us to take bathroom breaks, but the time was still running. When I was taking the CSSBB exam one thing I noticed was it takes time to go back and forth between the CSSBB Primer and the questions. I think if I had to do this again, I would pretend this was a closed exam. Even though it’s an open book exam, due to the time limitations I would consider doing the practice tests as though it was a closed book exam. When I was taking the exam what I did was I took a first pass at the exam and if I was spending too much time on any questions I flagged it and came back to it later. If you don’t want to take the CBT CSSBB exam there is still one way to take the CSSBB exam. The Paper & Pencil CSSBB Exam I believe is still given at the annual ASQ Conference. However, here is another way to look at the six sigma bok (asq cssbb bok). When we look at the cssbb body of knowledge in another way you can see Measure and Analyze make up 38% of the questions on the asq certification exam. However, if we include Improve then close to 55% of the questions come from Measure, Analyze and Improve for the six sigma exam. If were to include Measure, Analyze, Improve, Control and Define then over 80% questions on the asq certification exam would basically come from the DMAIC area. If I was taking the cssbb certification then I would first try to focus my attention on Measure and Analyze first since these are the hardest areas for most people. I think some people might need a a refresher on statistics especially as they are studying for the six sigma black belt certification. Since there is a quite a bit of information covered in the six sigma black belt exam you might want to consider signing up for this asq cssbb training and I am confident with the asq black belt training you too can become asq cssbb. I am a graduate of Yale University and I am an ASQ Certified Six Sigma Black Belt. I started my career at a major investment bank in New York City. My investment books include How To Create A Trend Trading System For Stocks (2012), How To Find The Next Trend Trading Stock (2012), How To Win More With A Trend Trading System For Stocks (2013) and Every New Trader’s Greatest Enemy (and How to Beat It) (2013). In addition to teaching and writing books about process improvement and financial markets, I also develop statistical and algorithmic financial models to generate superior risk-adjusted return streams. Capital preservation and risk management are at the core of my investment philosophy. ASQ is a registered trademark of the American Society for Quality, which is not affiliated with this course. Test names and other trademarks are the property of the respective trademark holders.